Your Instagram feed is the first impression a user gets when they look at your profile. In my own experience, I've noticed my profile grow much faster when I maintain a consistent theme than when I post random photos outside of the theme I've chosen. The easiest way to do this is to create (or buy) a preset that you can add to every photo. Pick one or two colors that you want to be most prominent in your theme, and stick to those. Accounts that are unique, like Sukiicat, a Bengal cat that adventures all throughout Canada, are able to gain a lot of followers (nearly a million for Sukii!) because they have interesting content that people haven't seen before. It may be tempting to make a generic travel Instagram account, but think of a way that you can differentiate it if you want to set yourself apart from other accounts that are growing quickly. Maybe you only post photos of waterfalls or only drone shots of locations. Pick something you're interested in and create the best photos you within that niche. This one is a given, but make sure you are posting high quality photos. You can certainly get away with iPhone photos, but if you want to take your account to the next level it's best to use a DSLR or hire a photographer. There are dozens of photographers on Shuttr you can hire in Los Angeles, New York and Seattle if you just want to try out increasing your production value before actually buying a new camera. The photo on the left was taken on an iPhone X. It's nice... but the photo on the right (shot by Tiffany, a Shuttr photographer based in Seattle) is much better quality and is really able to capture a different look and feel in comparison to the iPhone photo. Collaboration is common among YouTubers and is one of the fastest ways to grow on social media. Collaborating has now caught on with bloggers on Instagram. If you're looking to grow your Instagram account, collaborate with accounts that are a similar size to yours. Make sure that both of you are in the photo(s) that you post and to really cross promote effectively, it's best to introduce each other to your own respective audiences. Posting at the same time on your Instagram story is a great way to supplement your collaboration. 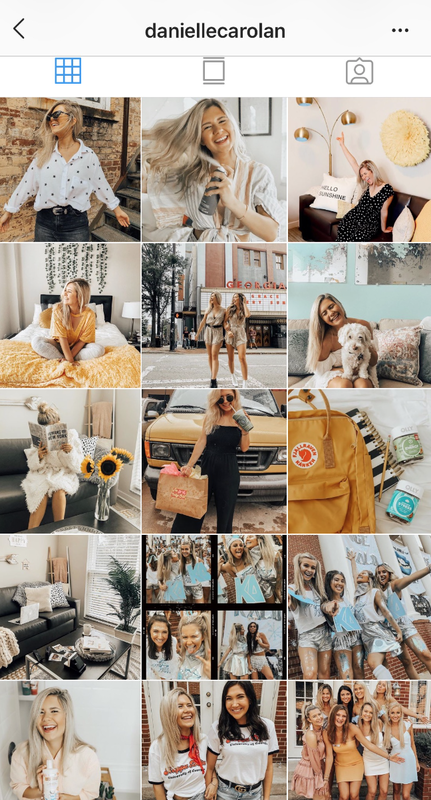 Personally, I just post photos with my friends since I'm not too concerned about growing my account – but I've seen Instagrammers collaborate with other accounts and grow quickly this way. Funny, personal and relatable captions increase engagement, which boosts your photo in the Instagram algorithm. Avoid vague and boring captions. Or worse, no caption at all. Even just an emoji is too vague to really push someone to engage. When people are able to connect with your caption they are far more likely to like and comment on the photo. We can see the photo on the left with a 🐬 emoji as the caption only has 50 comments. The photo on the right has a much more authentic caption and asks followers to respond, generating 3 times as many comments, as well as more likes, in return.